Two jazz professionals, journalist Andreas Müller and label manager Dave Stapleton, had a brief chat about Finnish jazz prior to Jazzahead! 2017, the international jazz expo and showcase festival taking place from 27 until 30 April in Bremen, Germany. 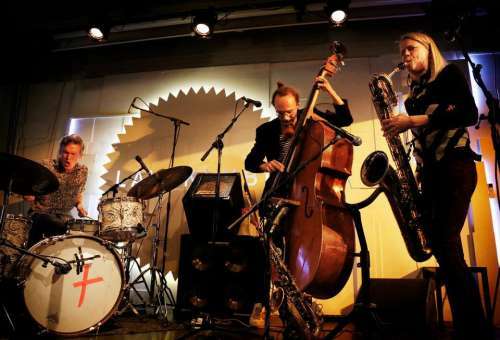 It’s no longer a secret that Finland regularly produces jazz music that makes waves well outside of the country’s borders. Thanks to the success of Finnish bands covering a broad spectrum of styles within jazz, a growing number of labels and journalists are paying attention to what’s cooking up north. Among those with their finger on the pulse of new jazz from Finland are the Berlin-based journalist Andreas Müller and Dave Stapleton, musician and the head of the UK based label Edition Records. Müller has been covering Finnish jazz extensively on his radio shows on Deutschlandradio Kultur and in print. He has also visited Finland several times to keep up with the latest developments on the Finnish scene. Stapleton, also a familiar figure in Helsinki, has released a number of albums by Finnish artists through Edition Records, including the latest two Emma Prize winners, Verneri Pohjola’s Bullhorn and the Aki Rissanen Trio’s Amorandom. One of the big success stories on the label is Oddarrang, a five-piece led by Olavi Louhivuori. Müller and Stapleton linked up to talk about their relationship to the Finnish jazz scene. How did you initially get interested in jazz from Finland? Andreas Müller: My connection dates back ten years or so, and around that time I was quite fed up with new jazz music and the Berlin improv scene. I was mostly searching for soul and funk records then. A guy at the record shop recommended that I check out the 7” vinyl single “The More I Look at You” by Timo Lassy. I thought “What? Jazz?”, but that track completely blew me away. It was short and sweet, just like the old Blue Note releases, and I bought the Timo Lassy LP, as well. That track not only got me interested in Finnish jazz but brought me back to jazz altogether. I thought that if there’s more like this, I really want to hear it. That was it. Dave Stapleton: For me it was meeting Olavi Louhivuori, and seeing him again by chance at Jazzahead 2011. He was playing there with Mats Eilertsen’s group. Olavi gave me some of his new music, and I got into it. Through Olavi I met Verneri Pohjola, and through Verneri I met Aki Rissanen. Alexi Tuomarila was somebody I had heard many years before, and linked up with again. So I would say that my introduction was through individual musicians rather than the scene as such, but I got to hear more and more great music all the time. DS: I think Finnish jazz has a certain sound. It’s quite a generic statement to say that but I would say that it’s not that typical Nordic sound. That makes it more interesting for me. I like to hear a band swing but still to have that certain kind of emotion in there. That’s sometimes missing to me in the more minimal “Nordic jazz” sound I hear elsewhere, and in the New York scene, for example. Many of the Finnish artists like Alexi Tuomarila and Olavi Louhivuori to me represent a musical thinking where the melodies are a bit melancholic, and the harmonies are more minor, perhaps modal in some ways. Their music is packed with emotion. AM: Valtteri Pöyhönen [of Dalindèo and Ricky-Tick Big Band] calls that “Slavic soul”, and I’m totally with you on that. I think with many Finnish bands it’s also interesting that when you see them on stage, they really seem like a group. There’s a lot of style, I guess. It’s a small scene, so musicians know each other, and I think there’s also often some humour in the music, in a good way. And there’s also a lot of good design when it comes to record sleeves. DS: Finland is a small country, so I suppose what really surprised me was the amount of creativity. I think the size and the activity of the jazz scene is almost similar to the UK or even Germany, although Finland is so much smaller. I don’t know why that is or if it’s just a perception of mine, but the quality of music coming from Finland is really high. I was also impressed by the sense of image and presentation with the bands. I could tell that the bands had thought about how to be on stage. It’s great to see, especially for someone involved in promoting music. AM: I think it’s also interesting how Finland has a very good jazz schooling, but the players seem to be able to break free from it in order to be original. One band pops into my mind: Mopo. They released some great jazz music as a trio, and the next thing I heard was this acid folk record with a singer-songwriter [Ville Leinonen]. I think it’s all moving very fast now over there. Another group which is very interesting is Bowman Trio. They are super young, their compositions are great and they bring together some shades from the past, but with their own style. How do you view the showcase list of Finnish bands at Jazzahead this year? DS: Of course I’ve got my favourites there, as there are two bands on my label [Aki Rissanen Trio, Verneri Pohjola Group], and actually I don’t know the other ones that well. I’ve heard Kari Ikonen Trio but the other five are new to me. It will be great to check them out. AM: To me it’s kind of a strange pick, I suppose. Gourmet released their last album already some time ago, so that was a surprise. I didn’t know they were active anymore. That being said, I’m happy to see Dalindèo in the lineup, as they are one of my favourite bands, who also represent a lot of what I like in the Finnish scene. Valtteri Pöyhönen could probably play the role of a guitar hero but it’s great how he just plays the necessary few notes, and he’s also a great composer. VIRTA is a new discovery for me and I really like their approach, playing a sort of dystopic music with their own twist. I really like the record, and I’m looking forward to seeing them live. Also Verneri Pohjola playing his father Pekka Pohjola’s music is something which I definitely need to see, as I’m looking forward to the release of his new album Pekka. More about Jazzahead! and the Finnish artists and groups at the festival here.